AMMAN — His Majesty King Abdullah reaffirmed on Friday that “today, nowhere is it more important to act than in safeguarding Jerusalem”. Speaking at a ceremony attended by Her Majesty Queen Rania in Assisi, Italy, after receiving the 2019 Lamp of Peace award for efforts to promote human rights, harmony, interfaith dialogue and peace in the Middle East and the world, King Abdullah noted Jordan’s duty in line with the Hashemite Custodianship of Jerusalem’s Islamic and Christian holy sites, a Royal Court statement said. “As Hashemite Custodian of Jerusalem’s Islamic and Christian holy sites, we are bound by a special, personal duty to the security and future of the Holy City,” His Majesty noted. “Ties of love and concern bind the Holy City to billions of Muslims and Christians around the world, and Jerusalem should be and must be a unifying city of peace,” the King underscored. “Such evil, wherever it happens, is our suffering, too,” the King said, asking the attendees — who included German Chancellor Angela Merkel, Italian Prime Minister Giuseppe Conte, Italian Episcopal Conference President Gualtiero Bassetti and President of the European Parliament Antonio Tajani — to observe a moment of silence for the victims of the New Zealand attack and all victims of hatred. His Majesty accepted the Lamp of Peace award, which recognises global figures for their work towards promoting peace and harmony, “on behalf of all who are working for a better future, and, most especially, on behalf of the people of Jordan, Muslim and Christian alike, who are making sacrifices every day for a better future for all”. Since its launch in 1981, the Lamp of Peace has been awarded to a number of political and religious leaders, including Chancellor Merkel in 2018, former Polish president Lech Wałęsa, Palestinian President Mahmoud Abbas, former Colombian president and Noble Prize Laureate Juan Manuel Santos, Pope Francis, Pope John Paul II, the Dalai Lama and Mother Teresa. The King, who received this year’s award from the Custos of the Sacred Convent of Assisi Father Mauro Gambetti, said Muslims and Christians make up more than half the people on earth. “It has never been more important to come together in harmony,” His Majesty noted. “The principles of coexistence and interfaith harmony are deeply embedded in Jordan’s heritage. Our country is home to a historic Christian community. All our citizens actively share in building our strong nation,” the King said. “And indeed, Christians have been part of Middle East societies for thousands of years and are vital to the future of our region,” His Majesty stressed. “The people of the world do not have to be the same in order to have the same concerns, share the same needs or hope the same hopes. To reach a better future, we must find a common path,” the King said. Noting that “Jordan’s commitment to harmony and peace underlies our international role”, His Majesty highlighted the Kingdom’s role in the fight against terror and hatred on all fronts within a holistic approach, and in seeking effective solutions to global and regional crises. The King also reaffirmed Jordan’s ongoing efforts for a lasting resolution of the region’s core conflict, the Palestinian-Israeli conflict, based on the two-state solution. His Majesty concluded the speech with a call for peace and harmony, according to the statement. “Today, all over the world, millions of Muslims are coming together to perform Friday prayers, as those pious Muslims did who came to their mosques in New Zealand two Fridays ago. And today, as every day — five times a day — our prayers are calling for peace,” the King said. “So I ask you to listen to that call. I ask you to help be the lights of peace who create the understanding and hope that our world desperately needs,” His Majesty concluded. In his remarks at the beginning of the ceremony, Sacred Convent Custodian Father Mauro Gambetti commended the King’s efforts in promoting interfaith dialogue and peace. He also lauded His Majesty’s commitment to education reform, protecting religious freedom and offering millions of refugees a safe haven in times of conflict. Father Gambetti referenced His Majesty’s speech at the European Parliament in 2015, quoting him as saying that Islam demands respect and caring for others. Gambetti added that the Islamic greeting is one that wishes peace upon others, which is aligned with what Saint Francis of Assisi drew from the Bible. The Sacred Convent custodian thanked the King for promoting the shared commandments between Islam and Christianity on loving God and loving one’s neighbour. He added that such efforts enhance understanding between all religions and underscore the shared values of peace between them, the statement added. Father Gambetti thanked His Majesty for safeguarding Islamic and Christian holy sites, and called on him to continue his efforts in promoting and enhancing peace and interfaith harmony. 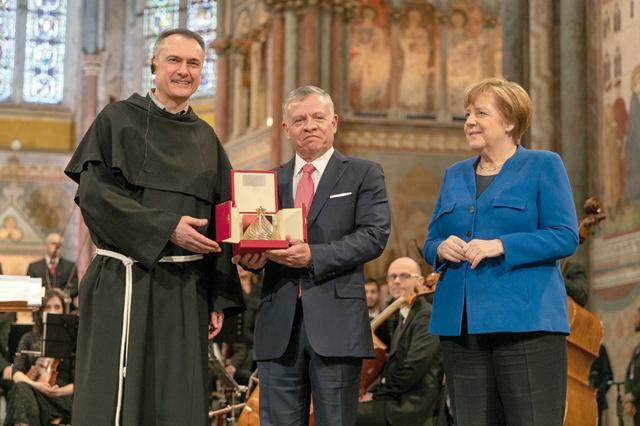 Also speaking at the ceremony, Chancellor Merkel commended His Majesty’s efforts in promoting peace and harmony, as well as Jordan’s role in hosting Syrian refugees. Highlighting the refugee burden undertaken by Jordan, Merkel said it is as if Germany were hosting over 5 million refugees, or if Italy were hosting 4 million refugees. She noted that Europeans should always remember what the King has done for refugees, adding that Jordan deserves Europe’s respect, solidarity and support. Chancellor Merkel said the message of interfaith dialogue that His Majesty promotes is one of utmost importance, pointing to “A Common Word” as a historic event in Islamic-Christian relations. She described the King as a role model for people around the world, dubbing him a leader of peace. Jordan, she said, has proven to be a cornerstone for peace in the Middle East, having maintained its safety and stability. She also commended the King’s efforts in the peace process, promoting the two-state solution for the Palestinians and Israelis. The event included a tour of the Sacred Convent of St Francis of Assisi, during which Their Majesties visited the Tomb of Saint Francis and signed the Flag of Peace, according to the statement. His Majesty also signed the guest book at the Sacred Convent.